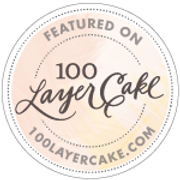 I have been extremely lucky to have my work featured - as a business owner, as a wedding planner, and beyond. I am so humbled by these features, and hope you love them, too! “Welcome to winter, friends! Even though it’s cold and dark, I think that there’s something so cozy and romantic about this time of year. And what better way to enjoy it than to snuggle up with your love and capture some of that love with a snowy engagement session, or glittery winter wedding day?! “Please tell us about your art. "Morning, Cakies! We’ve actually seen a couple of super duper unique butterfly-themed real weddings here on 100LC (this + this come to mind) in the past, so it was extra special to see this concept come to life in a completely new way, as dreamt up by Stone Fruit and Olive Fine Weddings & Events at the ever-chic Allegro Chicago. While scrolling through the glamorous images Allie Appel Photography shared, be sure to read all about the team’s concept—it’s sure to inspire whether you’re planning a spring or fall wedding." "When you have a chemistry that feels like it was ripped right out of a Rom-Com, there is no need for all those over the top wedding details. This beautiful and minimal winter wedding day was sponsored and designed by Olive Fine Weddings & Events. But behind every great project is a great team, and Maureen of Stone Fruit was Olive Fine Weddings right hand on this fabulous inspiration. " "This black tie wedding in Ithaca, New York by RachelLiz Photography is full of warmth and romance! 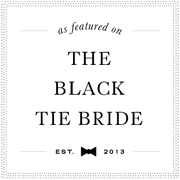 With this black tie bride being a wedding planner herself, the details throughout the day are perfectly presented. Her black tie style blends elegance and romance beautifully." "We’re always bombarded by how great it is to pursue your passion, etc – but we’ve spoken with enough people to know that it’s not always easy. Overall, would you say things have been easy for you? Nothing is ever easy, but I try and always live by one of my favorite quotes: “follow your bliss”. I am just so happy to be doing this work – it fills me with such joy to surround myself with other creatives and humility to know that there is always something to learn..."